Originally uploaded by Allen Gathman. Traditionally, I make a valentine for Binnielula every year. 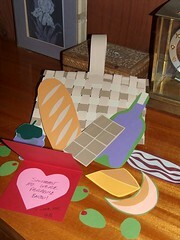 Here’s this year’s entry, a paper picnic basket (the weaving took me a while to figure out), and paper goodies including wine, bread, cheese, chocolate, grapes, olives, prosciutto (far right) and a slice of cantaloupe. And a valentine card, of course, with a slightly mangled quote from the Rubaiyat of Omar Khayyam. Yes, I did get some other things done during the day at work. This entry was posted on Thursday, February 15th, 2007 at 3:07 pm	and is filed under Family, Uxoriousness. You can follow any responses to this entry through the RSS 2.0 feed. You can leave a response, or trackback from your own site. Very nice. And I think “Furrinesses” is worth quite a few points as well. Well, I’ll try to post some cat pictures for you. 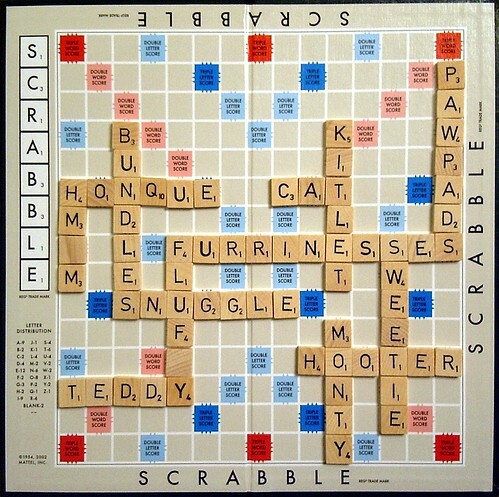 Furriness is worth 17 points with double letters factored in. It doesn’t double to 34 because it has 8 letters, which means someone had already done a word across the center star. When the last two letters were added to make furrinesses, the double letters had already been used, so the amount multiplied was 14, yielding a nice but not mind-blowing triple-word-using score of 42. That said, it’s a lovely valentine. Thanks, Reno. I was too lazy to figure it out myself. Of course, “fuzzinesses” would have been better. I can’t resist a Scrabble board. Sometimes I total license plates while on long drives. My Nevada place is a disappointing 6 points for the letters; my Oregon plate was 15. Also, in Britain “fuzzy” tends to be used of out-of-focus photographs, and “fluffy” for cats or blankets. So it wouldn’t have been J’s default choice. I am not convinced that “furrinesses” is in the Chambers English Dictionary, or even the complete OED.